Annuals are outdoor plants which grow for one season. Beginning in March, our greenhouses begin to fill up with the season’s first pansies and violas, quickly followed by hundreds of varieties of annuals promising spring and summer color. 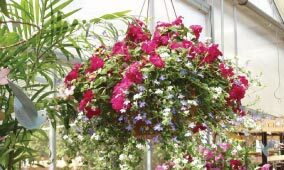 By May, the greenhouse is overflowing with locally grown blooming and non-blooming annuals suited for garden beds, window boxes, and containers. On a weekly basis, we refresh our greenhouse with Impatiens, Petunias, Geraniums, Begonias, and countless others to ensure that our selection is as healthy and attractive as possible. The autumn season introduces a different source of color: the chrysanthemum. Called mums for short, chrysanthemums perk up your garden and have become equally associated with autumn as the changing of leaves and carving of pumpkins. 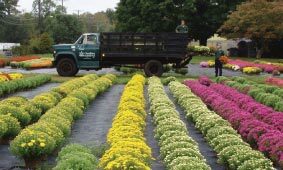 We take great pride in growing our own mums which develop from miniature cuttings to 8-12” mounds of fall color. A perennial plant will add beauty to your garden for many years. At Cheshire Nursery, we present 1,500 perennial varieties to choose from. Of this vast selection, we are particularly proud to have Connecticut’s best selection of Daylilies and Hostas. 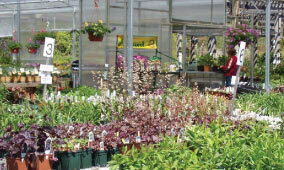 We take great pride in growing a huge collection of all your favorite perennials right here in Cheshire. With so many choices, the task of populating your garden can be daunting. For that reason, our perennial experts are readily available to help you choose perennials which will generate a full spectrum of color and attract butterfly and hummingbird visitors to your garden. For your convenience, our perennials are organized alphabetically by sun and shade tolerances to help you find exactly what you are looking for. 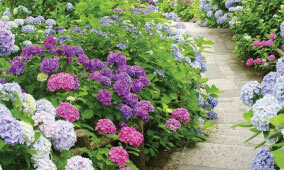 View Our Perennials Catalog (PDF)!